Funeral arrangements are set for the Rev. B.T. 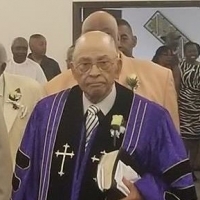 Bishop, a community icon who served more than five decades as pastor at First Baptist Church in Eliza­bethtown, Kentucky. The funeral is at noon Saturday, February 10, 2018 at First Bap­tist with Dr. E.A. Duke, moderator of Ken­tucky Mis­sionary Bap­tist Asso­ciation, as eulogist. Burial with full military rites will be in Eliza­beth­town Memorial Gardens. Visitation is from 2 to 8 p.m. Friday at the church. Masonic Rites will take place at 6:30 p.m. Friday.